Pruning is important for a variety of reasons. Pruning can help control the size of a tree, direct growth, influence flowering or fruiting, or maintain plant health and appearance. Pruning can also increase the safety of a tree by removing broken, diseased, dead, or dying branches. In addition to pruning, selecting plants that are suited to your environment and location are very important. The ultimate height and spread, in addition to location of overhead powerlines, should be taken into account when selecting trees for landscaping. Newly planted trees: Newly planted trees should not be pruned unless a branch is broken, diseased or dead. These trees need foliage to produce carbohydrates (sugars) that are then transported to the root system for initiation of new roots. Young trees: After a young tree is established for two to five years, the tree can be pruned to encourage a well-branched canopy. Lower branches can be removed to raise the canopy, if desired. Scaffold branches to be maintained in the tree should be selected such that they are 12-18 inches apart, are evenly distributed around the trunk and have wide crotch angles. Remove no more than 1∕3 of the total crown of a tree at one time. Young trees also need corrective pruning to remove crossing branches, double leaders, watersprouts, and root suckers. Older trees: Older, established trees, if properly trained when young, require little pruning. These trees should never be topped as this leads to poor branch structure and increased limb breakage. Use the three-point method of limb removal for pruning large branches (see diagram above and description below). This method ensures proper pruning and closure of wounds. Contact a certified arborist to prune larger limbs and remove trees, particularly if the tree is close to power lines or buildings. When doing any type of pruning, always use a sharp pruning saw for making pruning cuts. Also, be sure to disinfect your pruning tools with alcohol or a 10% bleach solution after each pruning cut to avoid spreading diseases. Step one: Select the branch that you want to remove. On large limbs, the first cut should be 12 to 18 inches from the limb’s point of attachment. The pruning cut should be an undercut made 1∕2 way through the branch (see diagram). 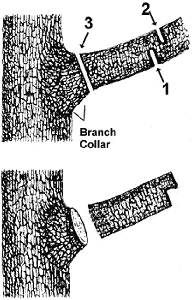 This pruning cut is very important because it relieves weight from the branch collar and prevents accidental tearing of bark from the tree’s trunk when the limb is removed. Step two: The second pruning cut should be made on the outside of the first cut (i.e., farther from the trunk). Cut all the way through the limb from the top down, thus removing the weight of the branch. Step three: The final cut should be made next to the tree’s trunk outside of the branch collar. Cut from the top down and cut all the way through the remaining branch stub. The branch collar should be left intact. DO NOT cut the branch flush with the tree’s trunk. A proper cut avoids large wounds, and allows the tree’s wound to close quickly. Should I use wound treatments? In general, wound treatments, such as tree paint or wound dressing, are not recommended. These compounds slow down wound closure and promote decay. One exception when wound treatments are recommended, is the case of oak trees that are pruned during the growing season. Using wound treatments on oaks is important to keep out insects that transmit the oak wilt fungus (see University of Wisconsin Garden Facts XHT1075). When should I prune trees? Most deciduous trees should be pruned in late fall to winter. At this time of year, you can see the overall branch structure easily, and most insects and disease causing organisms are not active. Late fall/winter pruning is especially important for oak trees to help prevent spread of the fungus that causes oak wilt (see University of Wisconsin Garden Facts XHT1075). Late spring and summer are usually not good times of year to prune because disease pathogens are present and wound closure is slower. If you prune in late winter, some trees may bleed or ooze sap excessively in the early spring. The bleeding may be unsightly, but does not harm the tree. Examples of trees that bleed excessively are maple, willow, birch, walnut, beech, hornbeam, elm, and yellowwood. 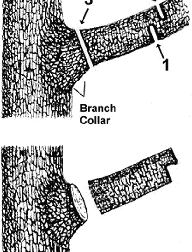 Branch collar: the ring of trunk tissue that surrounds a lateral branch at the point of attachment to the stem. Double leaders: two major, terminal growing points located at the top of the tree. Root suckers: vigorous, upright, adventitious shoots that arise from latent buds below the graft union or at the base of the tree. Scaffold branches: the large branches that form the main structure of the crown of a tree. Topping: an improper pruning technique that reduces the height of a tree by removal of large branches back to larger primary branches. This technique is not recommended. Watersprouts: vigorous, vertical, adventitious shoots that arise from latent buds above the ground or graft union on older wood. For more information on pruning: See UW-Extension bulletins A1817, A1771, A1730 and University of Wisconsin Garden Facts XHT1013, XHT1015, or contact your county Extension agent.